The Market Arcade was built as a convenient way to access the market from Main Street. It is in this climate that the growth and character of the Genesee-Ellicott-Oak neighborhood developed by the 1840s into a self-sufficient commercial and residential center for many German immigrants. Spurred by the multitude of skilled tradesmen, retailers and producers coupled with the increasing needs of local residents, this neighborhood was a logical location for a public market. In 1856 the Washington Market (also referred to as the Chippewa Market) was established, located on the city block between Ellicott and Washington Streets at Chippewa Street just south of St. Michael’s Church (original 1851, present building 1867). The market cleared what had been a sparsely-settled block which had contained a few assorted frame structures as well as the one-story Greek Revival-style Public School 13 (1838), which was subsequently relocated about a block south on Oak Street (1891-1915, NR 2005). This neighborhood over the span of two decades transformed from Major Andrews’ greenfields to the pre-Civil War era “suburb” of lightly populated settlement into a post-Civil War commercial center for the expanding metropolitan zone of Buffalo. The large market, which covered over 2.5 acres, was known as the largest market west of the Hudson River. The Genesee-Ellicott-Oak neighborhood became a more thriving commercial district based largely on its proximity to the Washington Market. The market was a significant center for life in Buffalo. Owned and operated by the City, it featured hundreds of vendors, selling a wide variety of produce, meats, cheeses, flowers and other products, most produced by the skilled local German community. 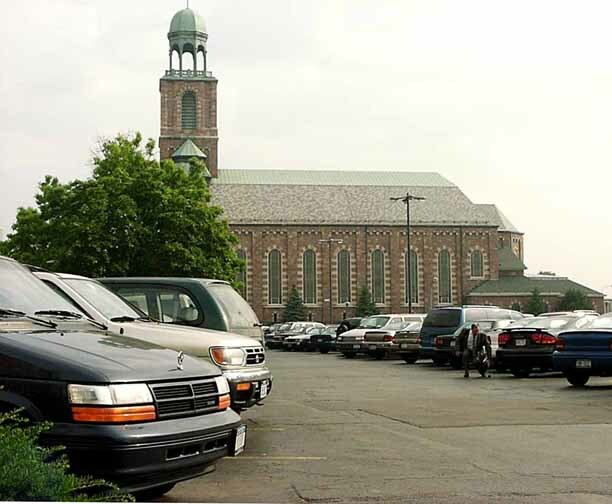 The centerpiece of the market was a large brick Romanesque Revival market building which housed the stalls for dozens of Buffalo’s finest butchers. Against the exterior walls of the building were housed stalls for poultry, butter, cheese, fruits and vegetable vendors, and stalls for merchants of crockery, tins, knit products, and other assorted products were arranged around the block. Overall, the market was a center of activity, noise and socializing, especially on the primary market days of Tuesdays, Thursdays and especially Saturdays, when the market was so crowded that moving around the more than 400 stalls was especially difficult. Because of the significance of the Washington Market as a center for trade, commerce and business, buildings in close proximity to the retail area also reflect the commercial character of the market. A majority of the buildings constructed in the late nineteenth and early twentieth- centuries adjacent to the Washington Market along Ellicott, Genesee and Washington Streets were commercial buildings. One of the most notable buildings in this area is the Market Arcade Building (1892 by E.B. Green) which is a Beaux-Arts Classical style arcaded indoor commercial building which connected Main Street to the west with Washington Street and the Washington Market to the East. This neighborhood also featured streets which were lined by commercial buildings dating from the 1850s to the early twentieth-century, typically featuring additional commercial vendors. Businesses in the immediate Washington Market area include the McClure Bloesser & Eggert Boot and Shoe Factory, P. Messner’s Chair Factory, and several saloons and boarding houses on Ellicott Street. In the same area were also located George Urban, Jr.’s Urban Roller Mills (founded in 1881) and his father’s retail flour shop on Oak Street. Genesee Street was also lined with commercial buildings and included businesses such as Frank Pfennig, retailer of tobacco products at 95 Genesee Street, cutler Gabriel Giesser at 99 Genesee Street and Henry Urban who ran a successful grocery store located at 123 Genesee Street for many decades. Because of the attraction of the Washington Market, this neighborhood around Genesee, Ellicott and Oak Streets was one of Buffalo’s thriving commercial and retail centers throughout the nineteenth- and early-twentieth centuries. There were more than 400 stalls. 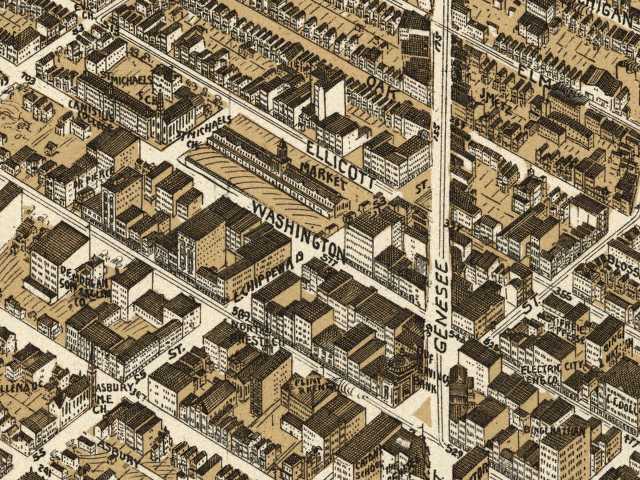 1902 Washington Market Map of market and surounding buildings. Taken from a larger map posted by the Library of Congress. Historical Places in "City of Light"